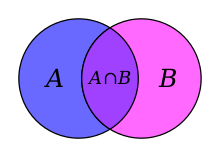 A Venn diagram illustrating the intersection of two sets. Set theory is a branch of mathematical logic that studies sets, which informally are collections of objects. Although any type of object can be collected into a set, set theory is applied most often to objects that are relevant to mathematics. The language of set theory can be used to define nearly all mathematical objects. The modern study of set theory was initiated by Georg Cantor and Richard Dedekind in the 1870s. After the discovery of paradoxes in naive set theory, such as Russell's paradox, numerous axiom systems were proposed in the early twentieth century, of which the Zermelo–Fraenkel axioms, with or without the axiom of choice, are the best-known. Set theory is commonly employed as a foundational system for mathematics, particularly in the form of Zermelo–Fraenkel set theory with the axiom of choice. Beyond its foundational role, set theory is a branch of mathematics in its own right, with an active research community. Contemporary research into set theory includes a diverse collection of topics, ranging from the structure of the real number line to the study of the consistency of large cardinals. There is no set whose size is strictly between that of the integers and that of the real numbers. In light of Cantor's theorem that the sizes of these sets cannot be equal, this hypothesis states that the set of real numbers has minimal possible cardinality which is greater than the cardinality of the set of integers. The name of the hypothesis comes from the term the continuum for the real numbers. In mathematics, the Cantor set, introduced by German mathematician Georg Cantor in 1883 (but discovered in 1875 by Henry John Stephen Smith ), is a set of points lying on a single line segment that has a number of remarkable and deep properties. Through consideration of it, Cantor and others helped lay the foundations of modern general topology. Although Cantor himself defined the set in a general, abstract way, the most common modern construction is the Cantor ternary set, built by removing the middle thirds of a line segment. Cantor himself only mentioned the ternary construction in passing, as an example of a more general idea, that of a perfect set that is nowhere dense. Georg Cantor (March 3, 1845 – January 6, 1918) was a German mathematician. He is best known as the creator of set theory, which has become a fundamental theory in mathematics. Cantor established the importance of one-to-one correspondence between sets, defined infinite and well-ordered sets, and proved that the real numbers are "more numerous" than the natural numbers. In fact, Cantor's theorem implies the existence of an "infinity of infinities". He defined the cardinal and ordinal numbers, and their arithmetic. Cantor's work is of great philosophical interest, a fact of which he was well aware. ... that there exists a composition of binary relations consistent with the composition of functions ? ... that there is an ordinal arithmetic extending the arithmetic of natural numbers to the ordinal numbers ? ... that sets which are both infinite and countable have a cardinality of aleph null? The Mathematics WikiProject is the center for mathematics-related editing on Wikipedia. Join the discussion on the project's talk page. This page was last edited on 26 February 2019, at 17:47 (UTC).